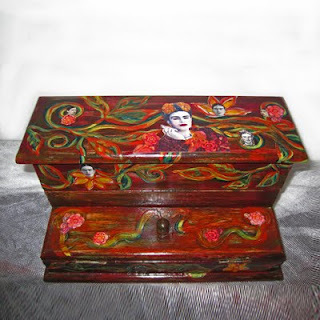 My Catrina Treasure Box was featured in an Etsy Treasury West called don't loose your head. 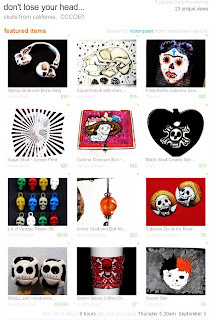 Its a collection of skull designs created by members of the California Crafters Club of Etsy - myself included! Dia de los Muertos and that other holiday are just around the corner!!! 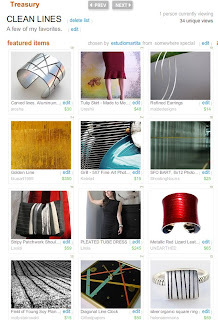 Been on a roll, signing on at the right time to reserve another Etsy Treasury. I was amazed at the huge amount of creative items I found on Etsy under the description of Butterfly. I could have filled so many pages with all the beautiful finds but had to restrict it to just 12. 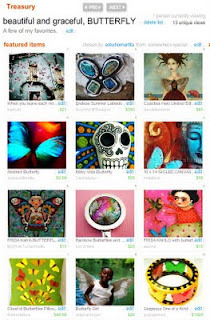 Maybe I'll try to do a Butterflies II treasury next time??! 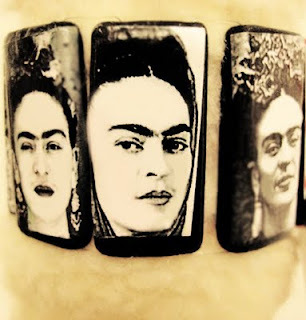 Created Etsy Treasury called, "SUBLIME"
Happy Wednesday to y'all. I'm getting ready to go to New Orleans (next Wednesday at 8am I fly out of SFO, along with my daughter Gaby, to New Orleans. Gaby is thinking about attending the University of New Orleans on Lake Pontchartrain (SP?). We will check it out then just enjoy and relax in my favorite city. Friends Csaba and David have their vacation apartment ready and can't wait to see them. Love those two!!! Well, see what YOU think. If you feel like commenting, please do so. Comments are always appreciated by moi!! 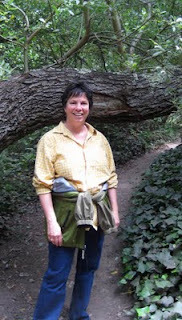 Spent a few hours this afternoon with my friend Maryellen. We hadn't seen each other for awhile and were in dire need of catching up. Both of us love to talk but we somehow always manage to hear each other out. 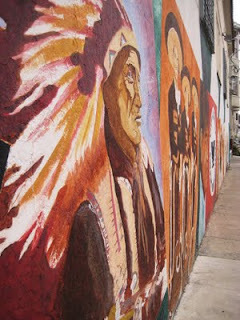 We started out in the neighborhood village, Glen Park. We had a cafe au lait at a little bakery called Destination. Always having a good time together, we laughed a lot and shared stories. 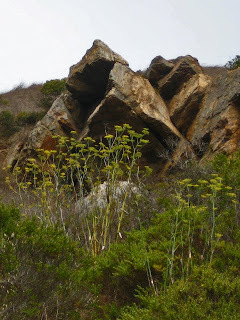 Afterwards, we walked from the village to Glen Park Canyon - an easy walk to the end of Chenery Street. 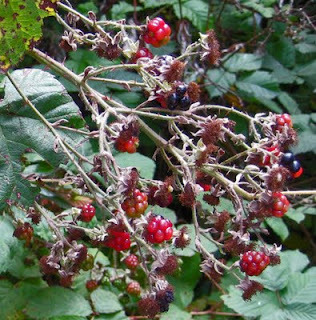 The canyon was beautiful with lots of trees, amazing boulders along the sides of the hills, the creek running through and wild berries growing in abundance. People were out hiking, running, walking their dogs and on and on. 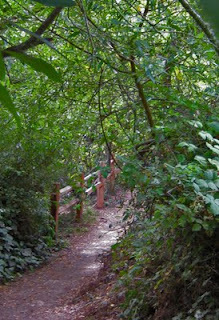 I love Glen Canyon Park. Its just a 10 minute walk down hill from my house. Once inside the park you feel like you are in the country instead of the middle of San Francisco. 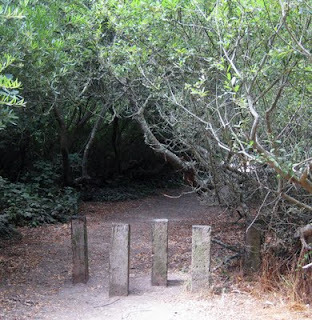 Glen Canyon Park is unknown to many people living in San Francisco. I am letting you in on this secret getaway! I took pictures of our adventure. Hope you enjoy them. Hey all. 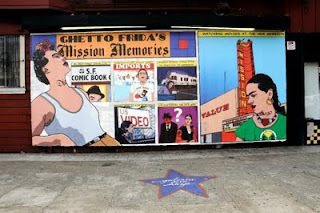 My very talented friend Rio Yanez just finished an amazing mural / billboard on 24th & Bryant on the side wall of the Galeria de la Raza. Check out his video and go, go now and see it!!! Amazing work Rio!!! 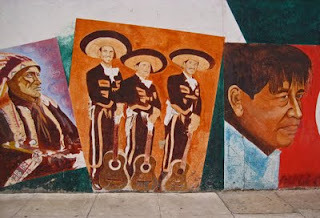 I’ve busted my brain, body, and creative skill to create the brand new mural/billboard at Galeria de la Raza in San Francisco. I have plenty of profound things to say about but at the moment I’m just so excited that it is up. 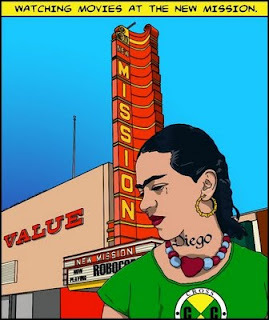 Ghetto Frida’s Mission Memories can be seen at Galeria de la Raza..."
GO, Go NOW to see it in person if you can!!! 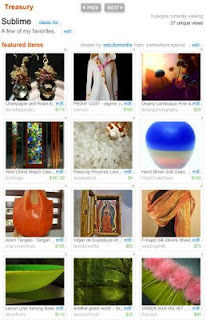 Created Etsy Treasury called "Clean Lines"
Just wanted to post a photo and inform ya'all of a new Etsy Treasury I created. I was finally sitting at my computer at the right time to snag a Treasury spot on Etsy! 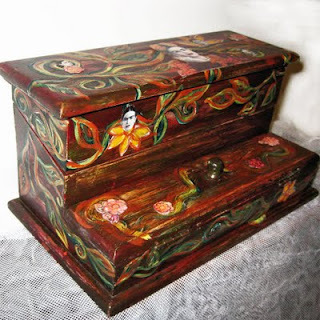 Take a look above and check out and even comment on the Etsy Treasury page. Been busy in the studio and finally took pictures of some of my new stuff! 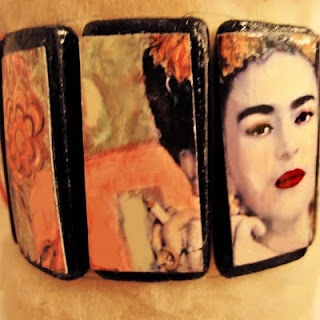 Here are some of the new bracelets I created using some of my own original artwork plus some photos of Frida. I think they came out really ok! 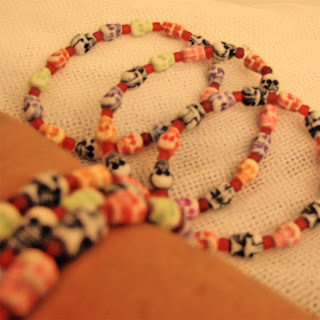 I also put together some fun skully bracelets using some bright multicolored, acrylic beads and red glass seed beads. There is a special deal if you order more than one! NEW WORK, just posted on Etsy!! GOSH sometimes it feels like such a tedious job to post new work on Etsy. Its really not that hard but I swear there are some days I don't have the brain power to come up with some catchy descriptive phrases that make my work sound SO FABULOUS! Of course the actual creating of each piece is the most fun! 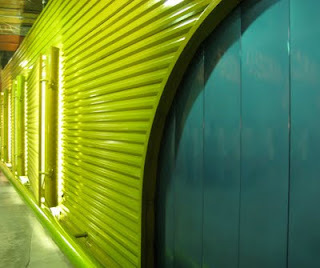 Starting with a something that is nothing special without a design is the most fabulous thing to face. Thinking through what supplies I have and what imagery I'd like to use feels like drinking a cool glass of water on a hot day. So refreshing! Putting various colors together to highlight imagery is so much fun. I love the whole creating process. I have to admit though that while I'm working, I'm continually trying to ward off those evil, slivers of doubt. Always trying to enter my brain, they can eventually hold my hands hostage. Those thoughts intermittently rattle my brain, asking me,"IS THIS REALLY GOING TO WORK??" The truth is I can't allow myself to stop and listen. If I do, my work at that point might as well be over. 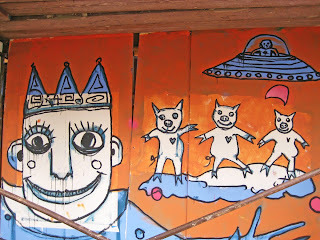 No, I have to keep going, keep painting, keep pasting. I don't have time to address those slivers of doubt. My mind seems to have a natural fly swatter that keeps any negativity at bay. Thank goodness.... so I can work in peace! So at this point you might be saying,"She's loosing it. She's hearing voices." Well, I feel actually fairly lucid right now considering I am always one to let loose with some emotional outbursts. The outbursts have more to do with seeing issues too clearly (I'm so confident here) and feeling they need to be resolved immediately. Off the point here...sorry. The slivers of doubt are more my process for getting work done and my motivation to keep going. It works for me! So those are my ramblings for today. My daughter just called from her job at the De Young. She is off work early and in need of a ride. MAMA TO THE RESCUE....at least for now! Took myself out to lunch at St. Francis Fountain on 24th Street & York in the Mission. Had a breakfast for lunch, read the paper and enjoyed Las Alternativas... the wait help with their multiple tattoos, multiple runs in tights and of course multiple piercings. Ah San Francisco, the city I love! The food was okay but the people watching entertainment was much better. 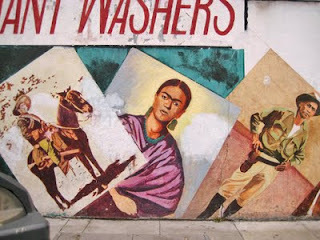 Afterwards I walked outside and saw the fabulous mural on the side wall of a laundromat with the words: Giant Washers written above. Decided to take a few pictures and share the beautiful artwork with all of you. 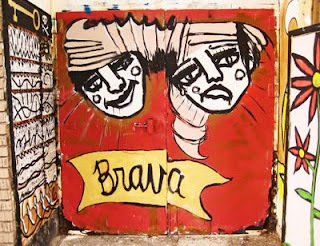 After I finished taking pictures of the mural, I walked by Brava for Women in the Arts (which they are renovating) and saw some fun and funky murals painted on the temporary wall surrounding the construction. I included a few of these pics too! 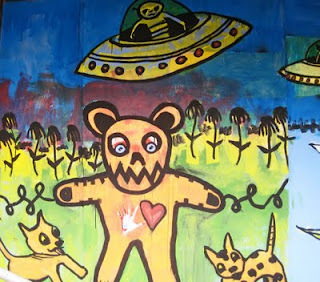 It was a visual goldmine out there on 24th & York. I love my town. I'm exhausted but so happy with the results from participating in the City of Oakland's First Friday. During the first Friday of the month, Oakland galleries and museums open up their doors to the public showcasing the work of artists and crafters. 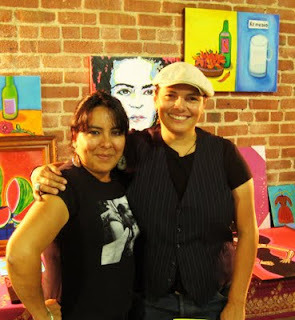 Giovanna Tanzillo, owner of Uptown Body and Fender garage and a tireless supporter of the arts, transformed her fabulous auto body repair shop into an even more fabulous gallery. The old brick structure, beautiful overhead lighting and twinkling white lights lining the walls, made for a wonderful environment to sell. Top that off with a beautiful Trio performing music that sounded like a cross between French "cafe society" music and Mexican ballads. Round tables were set in in the center of the garage so First Friday revelers could sit, chat, drink wine and sample snacks. What a great scene! Sales were fairly steady for me (yeah, yeah, yeah)!!! 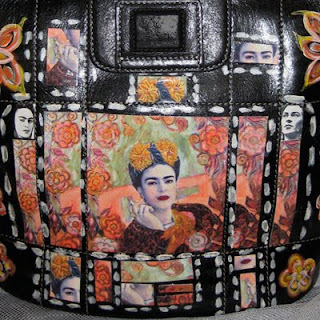 A big surprise came when a male customer (didn't get his name or card) came up to me and asked to buy my Te Amo Mucho purse. I gave him the price, wrapped it up and he gave me one bill. He said to keep the change. I assumed it was a $50.00 bill and thanked him for the extra amount. He left and when I looked at the bill in my hand...it was for $100.00!!! I was beside myself. I immediately went over and thanked him again and gave him a big hug. He said he's an artist and gallery owner and knows how difficult it can be to pursue a career in the arts. WOW...this has never happened to me before. Afterwards, the same guy went around buying items from various artists and leaving his "tips" with everyone. 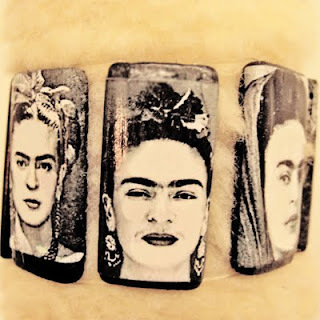 After he left, I spoke with Rachel Anne Palacios (the curator of The Many Faces of Frida) and we decided he was our guardian angel. The most interesting thing about all of this is that at the beginning of the event, I had a chat with Rachel about how difficult our life is as full-time artists. I said to her how all consuming our work is from the creation of each piece to the promotion of it and hopefully to a sale. We were both expressing frustration at how consistent hard work does not always payoff in the immediate. The gist of our conversation was that building, challenging your art plus expanding your customer base is a long term effort. Both of us expressed the feeling that we didn't want to do anything else and these efforts were what it took. Well, lo and behold Mr. Guardian Angel came in that night to raise our spirits and confirm we were on the right track. Do I really believe he was a guardian angel who heard our laments? Well, he looked pretty real to me. I do somehow feel that someone, somewhere heard our concerns and sent him as our gift. Call the experience whatever you like but it was definitely otherworldly! I do believe we are not always in control of our reality. 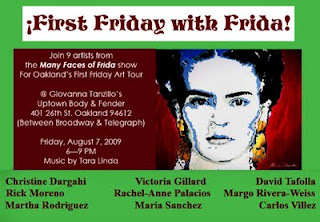 If you're in the East Bay on Friday, stop by for First Friday with Frida. 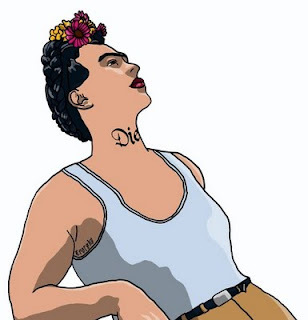 Beautiful Frida related art plus more by several Bay Area artists!! As you can see, I somehow missed Monday. I spent the day at home catching up on email and working on "assignments" I have due by Wednesday for MAU. 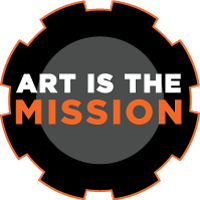 MAU is an organization I belong to that is trying to organize the many artists housed in many, many studios and homes throughout the Mission District in San Francisco. Currently there are about 100 members who have come together to pool resources and efforts to better promote our work and efforts. Its a great organization. We have a facebook page and you can join if you're interested in finding out what we are doing. 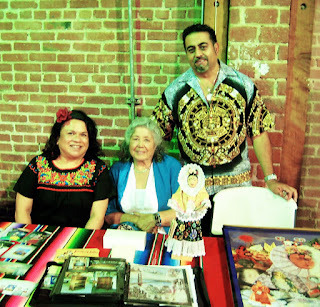 Posted a slide show from the Cruceros Art Bazaar in the Mission, Saturday night. There was a good crowd that attended, good talks and even some sales! This is a good thing. 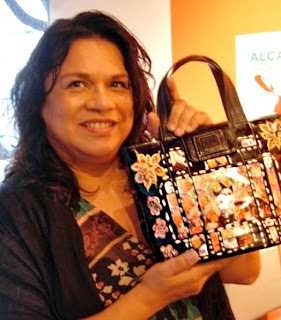 Rio Yanez, a fabulous artist, took the picture of me above with my new Frida purse. 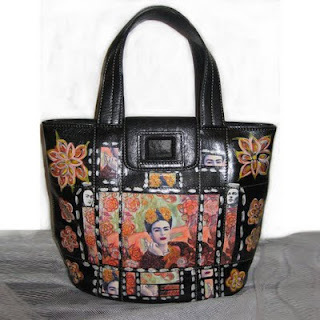 I love the pic and am happy with the new purse I made. If you're in the Area, come by for a visit and a look! 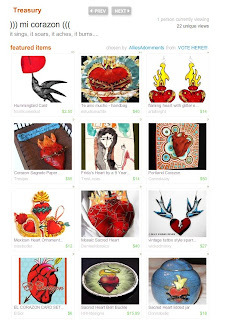 Chosen for Etsy Treasury called, "Mi Corazon"
Whew...feeling slightly "hung-over" from last night's Crucero, Artist Bazaar. Good amount of people stopped by. Good music, good friends - new and old. 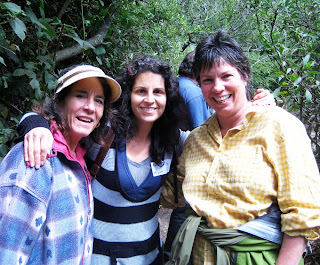 I saw many people I hadn't seen for awhile so it was lots of fun. In fact it was GREAT fun to run into old friends. I LOVED IT! I have a few pics I'll be posting later. For now, I have to wake up. Its 9am and I feel so sleepy. No one in the house is up except Kodi, our senior dog. In other important news... 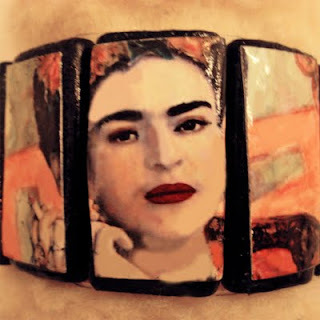 I was featured in an Etsy Treasury called Mi Corazon! 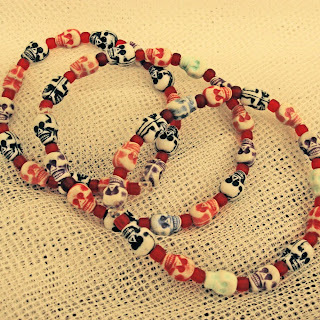 Allie, from Allie's Adornments, curated a group with....surprise....HEARTS!! For those that never had high school Spanish or aren't native speakers, corazon means heart in English. Its a lovely Treasury so please take a look. It will be posted for another day. 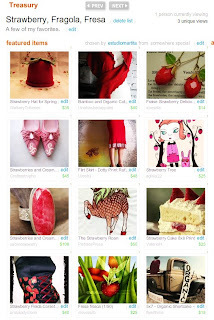 Created my own Etsy Treasury with the theme of my favorite fruit: strawberrys. 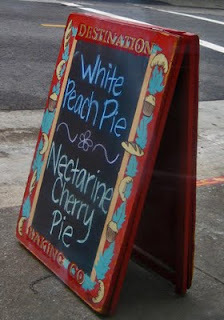 Come view some strawberry-themed items that may surprise you in their inventiveness and awake your palette!